Sven Boekhorst is one of the world’s most versatile skaters. Being on top of the game since the early 90’s, he knows his way around in the world on wheels. Either shredding the streets on street skates during Cityhopper or cruising full speed together with Greg Mirzoyan in Istanbul, the Dutchman can do it all. 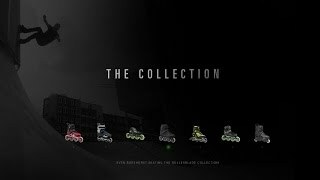 Recently Sven asked for 7 pairs of skates, "The Collection", to use for 7 successive days. We hooked him up with the following skates, each for a different discipline within the sport. With gear in hand, he went out and got some impressive clips. Sven and Niels Groenendijk skated each skate at a different location and tested their full potential. From this unique perspective, Sven has once again highlighted what it is to be Rollerblade®. Check out the video and see Sven skating "The Collection". Rollerblade® offers you the best skate for any skate experience you take on.